Thanks to the polarized nature of politics in the world today, students need to learn how to think critically about social issues. Argumentation can be both a type of critical thinking and a tool with which to teach students to think critically about social issues. 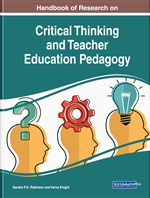 This chapter lays out a framework for teaching students how to develop critical thinking about real world issues through the use of dialogic argumentation. The impact of dialogic argumentative activities in the classroom are discussed, particularly as they relate to the development of metacognition and theory of mind, as well as how they help students develop an “inner-locutor” that allows them to evaluate both their position and opposing positions. Finally, a model for how these elements contribute to students' value-loaded critical thinking about social issues is outlined. In an increasingly polarized world with multiple streams of false or biased information, critical thinking and argumentation in the arena of social justice and social issues are important. Adolescents are tuned in and plugged in around the clock, resulting in near-constant exposure to sources of information that can be misleading. And unlike their parents and grandparents, today’s teens have the ability to (and in some ways are required to) receive information that aligns with their interests and confirms their positions. Adolescents self-tailor their news by getting it online and picking what stories they want to see, a phenomenon aided by the algorithms that shape web use. They are also more likely to get news from social media and satiric news shows like the Daily Show rather than traditional news outlets (Marchi, 2012). At the same time, the internet offers a platform for extreme voices. When social issues are raised online, it is often the most extreme ends of the spectrum whose ideas are “heard” by adolescents and others. So, how can students make sense of the information and issues they are exposed to everyday? One way of helping students make sense of information and social issues is via critical thinking. Critical thinking is not a new concept, nor is it only applicable to dealing with current social issues. Frijters, ten Dam, & Rijlaarsdam (2008) point out that when analytic thought is combined with the development of values, the resulting “value-loaded critical thinking” builds a stronger citizenry. In addition, studies show that having critical thinking skills helps people differentiate between fake news and real news stories (Beavers, 2011; Hobbs, 2010; Pennycook & Rand, 2017). Thus, aside from the importance of critical thinking in general, it is imperative for students to learn this skill if they are to make sense of the world around them and generate solutions to some of the world’s problems. If it is important for students to learn this type of critical thinking, it is important for teachers to provide training that helps them do so. There are many ways of approaching critical thinking skills in the classroom. In this chapter, the ways that dialogic argumentation can be a tool to help students develop critical thinking about social issues will be examined. First, the multiple ways to define critical thinking and the ways argumentation can serve as a key critical thinking skill will be discussed. Then the literature on how dialogue and argumentation work in the classroom will be presented, followed by the ways in which dialogic argumentation leads students to flexible thinking, including understanding of multiple viewpoints and development of values, which is a cornerstone of critical thinking about social justice issues outside the classroom. Finally, suggestions for future research directions will be presented. Dialogic: Programs or processes that engage two or more people in discussion with each other. Inner-Locutor: An internal interlocutor, or dialogue partner, that allows students to “hear” other perspectives as they work, particularly on argumentative writing. Theory of Mind: The understanding that others think, believe, and know differently than you do. Argumentation: The process of taking positions and backing them up with logic and evidence. The social act of argumentation is sometimes referred to as debate, while argumentative writing is often referred to as persuasive writing. Metacognition: The process of thinking about and regulating your thinking and others’ thinking. Critical Thinking: A higher-order thinking skill encompassing cognitive, emotional, and contextual practices to evaluate, analyze, and make judgments. Socioconstruction: When two or more people creating products or ideas together through collaboration. Socioconstruction (as opposed to co-construction) usually focuses on the social aspect of creation.